Commercial real estate is expected to be one of the big winners of the GOP tax bill signed into law by President Donald Trump, and some suggest Las Vegas could further benefit from California residents fleeing for tax gains. Buck Wargo interviews Jason Elredge. That’s the take from commercial real estate and housing experts and accountants analyzing the new tax bill signed into law last week by President Trump. That’s welcome news for the office market that has struggled with a high vacancy rate since the economic collapse a decade ago. It stood at 15.7 percent at the end of the third quarter, according to CBRE. The retail vacancy rate was 8.7 percent at the end of the third quarter. Matt Vance, an economist with CBRE and a research director and analyst for the Southwest region that includes Nevada, said commercial real estate was spared when Congress decided to maintain the 1031 exchange and commercial mortgage tax deductions. The biggest impact the tax bill will have on the commercial sector will be on office and apartment complexes as demand increases, Vance said. That would lower vacancy rates, increase rents and spur more development. Vance cited lower corporate tax rates and accelerated depreciation of new capital expenditures as economic stimulants. The corporate rate moves from 35 percent to 21 percent. Not everyone has shared the optimistic view that the tax cuts will stimulate the economy beyond the short term. Many economists have predicted the growth would be minimal and actions by the Federal Reserve to raise interest rates could negate the stimulus. There are also long-term concerns even about the most optimistic forecast that the federal deficit would be increased by $1 trillion. Time will tell if the tax bill increases economic activity, and if it doesn’t it’s likely to be revamped, Taylor said. In addition to commercial real estate, there are concerns about the tax implications on the housing market given the mortgage deduction has been lowered from $1 million to $750,000. Coastal markets like California, for example where there’s an income taxes, are property and income taxes have deductions limited to $10,000. KRE Capital in partnership with Dune Real Estate Partners and Northcap, purchased The Ogden in 2013. The group also owns Juhl in downtown Las Vegas and One Las Vegas on the far South Las Vegas Boulevard. Uri Vaknin, a partner with KRE Capital, said the group recently sold its most expensive home at The Ogden to a California buyer “on strict orders from his accountant to avoid additional tax liability” because of the GOP tax bill. Chris Bishop, incoming president of the Greater Las Vegas Association of Realtors, said there’s already a “major migration of people moving from California to Nevada,” because of the tax structure (and) because people can have a nice home in Las Vegas for way less than in Southern California. “We’re seeing a lot of people come here for that reason,” Bishop said. from $1 million dollar homes to $750,000, Bishop said. The luxury market has been the last segment to recover in Las Vegas, he said. Tim Sullivan, managing principal of Beverly Hills-based Meyers Research that tracks the Las Vegas housing market among others across the nation said the good news is current homeowners are grandfathered into the $1 million cap. The House bill was proposed at $500,000 so the compromise of $750,000 has helped, he said. 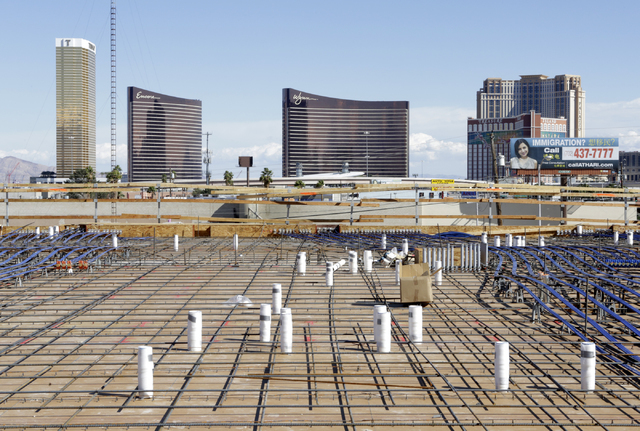 One of the biggest potential impact on Las Vegas housing, Sullivan said, is if the tax cuts spur casinos and other developers to expand and build additional hotels. That would spur additional job growth and migration that would trigger a high demand for housing and even more construction, he said. Taylor said most businesses he deals with from mom-and-pop operations to partnerships, entrepreneurs and corporations are happy with the tax bill. The problem is the tax bill is complicated and further instructions are needed to determine how it’s calculated. Not everything is explained in the law, especially some of the deductions when it comes to professionals such as attorneys, architects, engineers, accounts and doctors, he said. “There are some tricky computations for salary and most of the LLCs and partnerships do not issue a salary to the owner and some of the regulations need to explain how it works because the law is not clear,” Taylor said. On the immediate front, Taylor said with the tax bill there’s a 100 percent depreciation of assets purchased that now dates back to mid-September. It had been 50 percent until then. “There will be a lot of purchases happening right now before Dec. 31. That will create a deduction right now,” Taylor said. Payroll deductions for employees will be enacted in early 2018, and Taylor said he’s done some calculations already on how much workers will benefit. In the case of a couple with four kids earning $50,000 a year, they would save $850 in taxes. A couple with four kids earning $100,000 would save $1,800 with the new standard deductions, he said. Accountants will be busy figuring out the new tax law, said Taylor, who added changing a few rates is not changing its simplification.